Lost your key or got locked out of the house and need to leave in the middle of the night? No need to postpone your plans! Make the wise choice; call us and we will assist you immediately. We are the people with the right solution. When you cannot seem to find your key anywhere, when you dropped it into the river, broke it, or when the lock simply won’t work, you’re tempted to just call a platform. The dealer is always happy to help – for a small fortune – and that is only half of the problem, because you also need a ride home. No need to do that ever again. Just give us a call. Here, at Serrurierqc, we always have an expert ready to help, wherever you are. 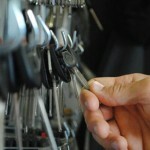 Serrurierqc is the automotive locksmith service. We are based in Montreal, Quebec, but our experts can help you wherever you are in the Montreal area. We work in the automotive niche because we believe in being the go-to specialists in our field. Instead of generic, half-baked services, we offer specialized, up-to-date, expert services through people who know all there is to know about each car brand and key model. We are committed to excellence. We value clean, safe interventions above everything else, and we will never be satisfied with “clever” fixes. We provide future-proof, on-the-spot solutions for your problems. We are committed to continuous improvement. As soon as a new car hits the market, we know everything there is to know about its key and locks. And no matter how old a car is, if there is a new, better way to deal with its locks, we will find it. We value fast servicing because we value your time. Our employees are not only expert locksmiths – they are skilled drivers who know every shortcut there is to know. We get to you in the shortest possible time, no matter where you are. Permanent availability: we are available 24/7. Car problems don’t stick to a 9 to 5 schedule, so neither do we, and our phone lines are always free. Careful, thorough screening. Everyone who wishes to join our team has to prove extraordinary aptitude in our line of work – and once we are satisfied with that, we have a thorough background verification process in place, to make sure that our experts are responsible, law-abiding citizens. Our experts observe the law as carefully as they observe the best practices of locksmithing. Custom solutions. We know that every client is one of a kind, so each of our solutions is one of a kind, uniquely-tailored to your requirements. Every intervention is a new challenge for us, so we come up with a new solution for every new problem. To sum up: Serrurierqc is a dedicated team of creative, well-trained, mindfully-selected professionals who can help you any time the keys or locks of your car malfunction. Call us now if you need us or if you wish to know more about what we offer, our rates and our coverage area.